I had every intention to put this recipe up just before Diwali since I had many requests for this laddu recipe especially after this post. I was travelling this Diwali which is very unusual considering that I love to have all the traditional pujas and festivities at home. But the travel to Chennai couldnt be avoided and after the important occasion for which we were there was over, we proceeded to Pondicherry for a short vacation. 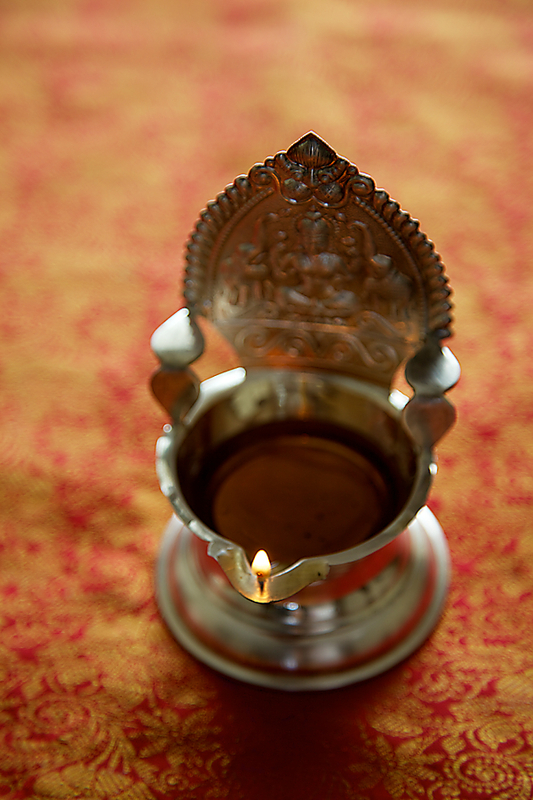 So, this Diwali meant that I did not get to wear my kanjeevaram saree, light my entire home with lights, have the Lakshmi and the Govardhan Puja and make the number of food preparations I had in my mind. But, I did manage to make these Besan laddus to carry with me and managed to shoot the pictures just before I left for the post to be up on Diwali eve. But life had other plans and there were quite a few events to attend and me falling sick and not being my usual self didnt help either. Since my inlaws also travelled to Chennai from Bangalore we had a small puja with arati in our hotel room and ate these Besan laddus along with the sweets my mother-in-law brought (no Diwali is complete for me without savouring one of my favourite sweets, Kaju Kathri or Cashewnut Burfi). I thought I have to put this very special recipe up today under any circumstances, before I got into the Christmas and New Year mood of cookies and cakes. I call this special because this recipe comes from my grandmother who has been known in our family to make the best besan laddus. My grandmother with the help of family members made 1500 besan laddus for my mother's wedding in 1978. I must admit that it is a bit difficult and requires a certain amount of skill, expertise and practice to master, but once done it is a mouthful of heaven in every bite. The secret to this recipe is ofcourse the proportion and the right amount of roasting the besan flour in the ghee. You under roast it and you get light coloured laddus with less flavour and you over do it and run the risk of burning the flour. The aromas that waft through the air while making it, the deep golden coloured soft texture of the laddus accentuated by the raisins and the scent of the cardamom makes this a surreal experience. I’m quite surprised with the fact that I’m so fascinated with the laddus I never liked as a child. But now its a different story as I love to feed, eat and above all make them. Surprisingly Hari does not have an aversion to these laddus and so they travelled with me to Pondicherry as part of my snack arrangement for those “just in case” moments when you are travelling with a child. 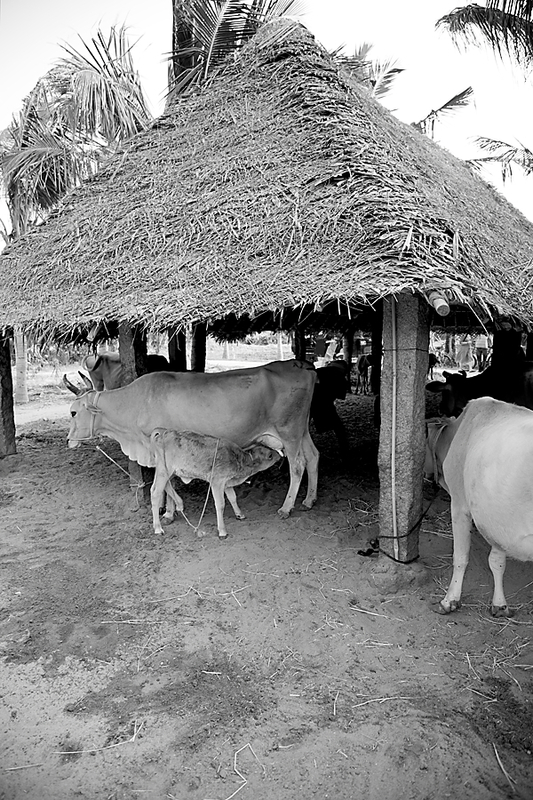 In Pondicherry, we stayed in an eco resort where I milked a cow in the organic farm, ate some great food and revelled in a natural environment and considering that it was a short stay, a resolve to get there again. Wish you all a very happy Deepavali (2015). It is very important to roast the flour correctly in this recipe. You over roast it and you run the risk of burning the flour and if you under roast the flour, you will have light coloured laddus with no flavour in it. Heat the ghee in a heavy bottomed wok or kadhai and put in the chickpea flour and roast on low flame for about 20 minutes until golden in colour and the entire kitchen is filled with the beautiful aroma of the golden roasted chickpea flour. Initially, the ghee absorbs all the chickpea flour and bubbles appear on the surface and later on assumes a liquid consistency. When the besan is nicely roasted in the ghee and is a golden brown colour and just before it starts to burn is the tricky stage, which occurs after 20 to 25 minutes after the start of the roasting. This is when we need to put in the extra 1/2 cup to 2/3rd cup besan flour. Soon after you put in the extra flour, bubbles start to appear on the surface again. If the mixture looks liquidy then we need to put in an extra tablespoon or two of the chickpea flour and cook for a few minutes more, 8 to 10 minutes. It is important to keep stirring all the while to prevent the besan or chickpea flour from sticking to the bottom of the pan. 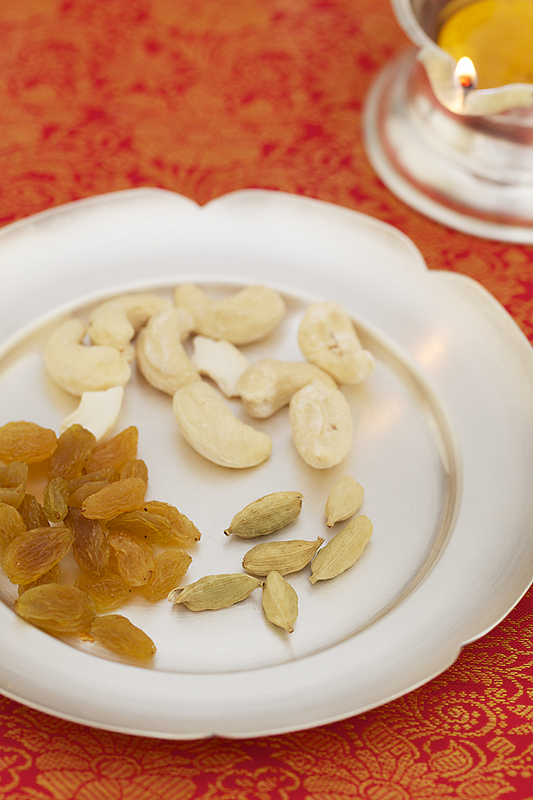 Take off the heat and add the cashews and raisins. Allow to cool completely. It is necessary to keep stirring the besan mixture even after taking off the heat as the besan continues to cook with the ghee until completely cool. 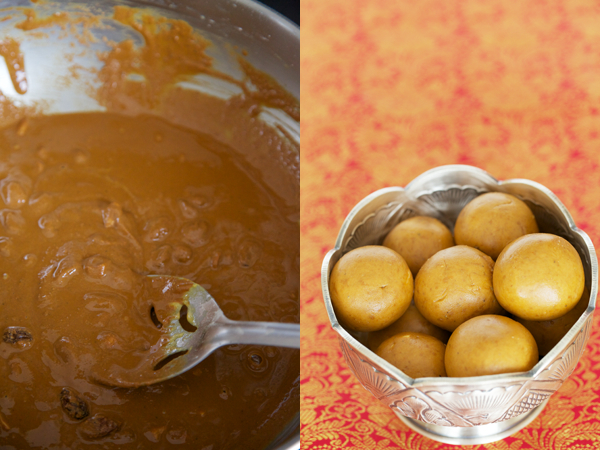 After the prepared mixture is cool, stir in the cardamom and sugar and form into laddus. If you find that the besan mixture is a little loose, then you can put in some more sugar to get a thick consistency to form the laddus. 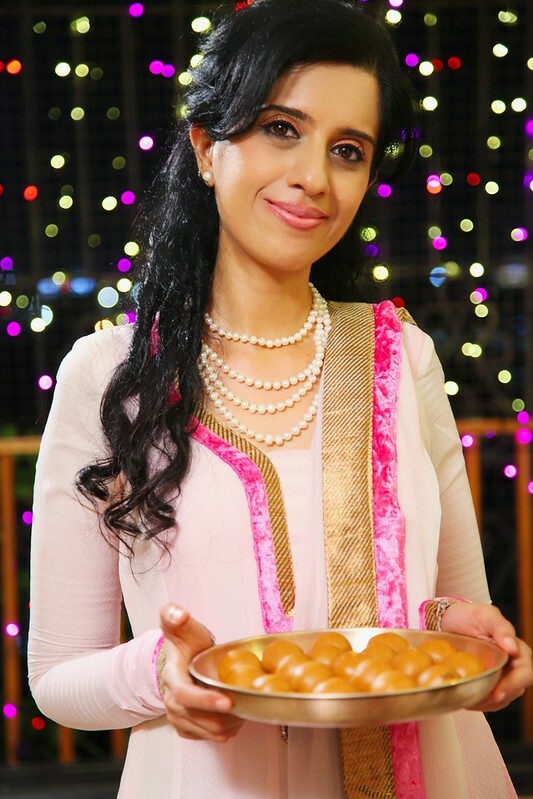 The roasting time is dependent on several factors- The quality of the chickpea flour and the thickness of the utensil in which it is roasted are prime determinants of the time required for cooking these laddus. You need to keep stirring the besan mixture after you take it off the heat as the besan continues to cook for a few minutes even after you take it is off the heat. Stir in the sugar powder, only after the roasted besan is completely cool. Makes approximately 48 small laddus. Wonderfully written and delicious recipe. I tried your mango cheese cake today and it came out great yogurt was a bit runny so I had to add 1 spoon corn starch though. these besan laddus are so perfectly browned, im a bit intimidated to try, because i dont think i could replicate it. but besan laddus are also on the top of my fav laddus list, so maybe i should bite the bullet and give it a go! also, your son suddenly looks so grown up and adorable as usual. i dont know if its because you havent posted a picture in a long time or if he has had a growth spurt, but he looks like a little man! adorable. Nice pictures and backgrounds z d beauty of this site. Was eagerly waiting for you to come back and post new recipes.I hope you r doing well now.I'm goint to try these ladoos today for sure.waiting eagerly for cakes n dessertd spc walnut pie..
Revati: If these laddus are on the top of your favourite list then you must give it a go. It took me 3 to 4 attempts to master. Thank you so much for the kind words for my son. Ruchika: Your enthusiasm and interest is inspiring to me. I'm a little better but not back to normal though. Thanks for enquiring! You seem to be a die hard cooking afficionado! I have never really made began laddus because I know it's hard to mater it. I hate bad began laddus! Good to know you enjoyed Pondicherry 🙂 My husband and I used to frequently go there before our daughter. I think it's time we make a trip to one of our favorite holiday destinations. I follow the same method, and the laddoos turn out really yummy! Ruchika: Very sweet of you to say such nice things! You seem to have put in a lot of efforts for Diwali and it seems it have paid off well! Keep it going! I'm sure your method is nice too but this is my fail proof method. Really tempting and drool-worthy sweet recipes in your blog. The precision in your recipes is awesome, which mean amateurs can dish out them with professional perfection. This besan ladoo recipe brought back my college memories where my marathi roomie from Bombay used to get these after every holiday. The previous post – atte ka halwa, reminded me of the Ashoka (which is similar, but has moong dal) which is a part of most tam brahm marriage meals. Would be delighted to see the Ashoka recipe if you have it from your family's excellent cooks. Look forward to more dishes from you. It looks like a wonderful recipe. I hope you enjoyed the festival! First time here. You have a brilliant website with breathtaking pictures! I have several ideas now for sattvik cooking, after browsing through your pages. Will be visiting here often! 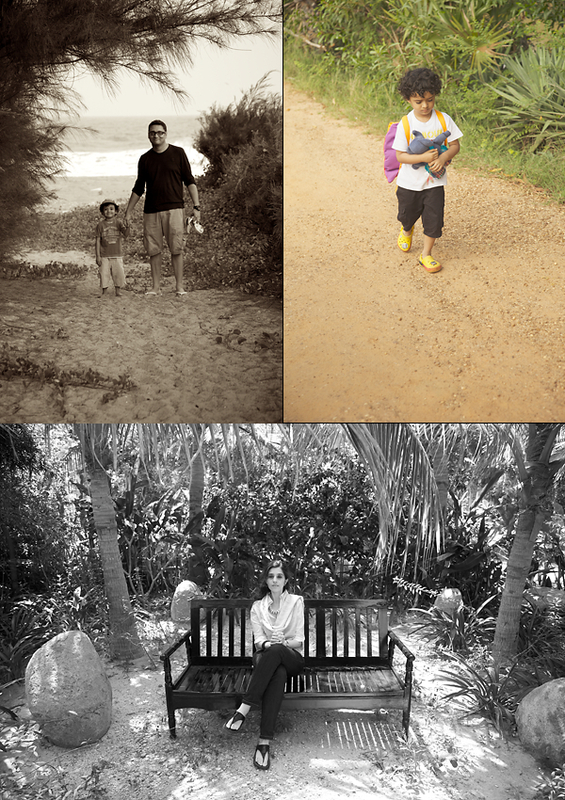 Hi anushruti, i have a new born blog which is now almost 6 months old. i don't have such a beautiful pics there as i have a very simple camera and that is also broken now. your dishes attracts me so much and pictures of food more then that. I have a question here that the extra flour which we will add after 20-25 min will remain uncooked. So it should be like that only? Do visit me. It will inspire me a lot. I made these laddus today. They were just fantastic. I especially liked the fact that the besan is roasted so well. More often than not, my complaint with besan laddus has been that they taste raw. Great recipe as always! 🙂 I'm slowly becoming your recipe tester, having tried quite a few of them already! Vidya: Look forward to hearing more from you! PariCash: The flour wont reamin uncooked as we continue to cook for 5 to 10 minutes more after adding the flour and since the remaining flour would have nicely browned this goes into the mixture and gives a good texture overall! cs: That's awesome! So great to hear that! Thank you for the feedback! What a lovely recipe Anushruti! Cant wait to try it. I would also love to know which eco-resort you stayed at in Pondicherry. We live in the US and I'm always on the lookout for new, eco-friendly places to explore when we visit India. Thanks so much! I remember one pic of all your silver ware that you had clicked outdoors at your mom`s….Lovely Anu! I tried this recipe yesterday….it tasted divine but I couldn't form laddus from the mixture….I think ghee was more so it spread as soon as I placed the laddus it in a plate…but the taste was really superb.My husband didn't mind eating it with a spoon as halva… thank you for the easiest recipe. Tejal: The laddus couldnt form as you might have used less flour. Mix in more flour next time and you will get laddus. I tried this recipe out today but could not get laddus to form at all despite following it to the T. The batter remained of a very loose consistency and simply would not change despite adding lots more besan than you even said. I was really disappointed 🙁 Ended up spreading it out on a plate and eating it with a spoon like Tejal yesterday. Any idea on what the batter must look like when we take it off the heat? It firms up a little on cooling but just too sticky and still runny to roll into laddus. Thanks. Nandi: The batter shouldnt be loose at all when you take the laddus off the heat. Are you sure you measured the ingredients properly? Did you follow cup measurement or the metric? 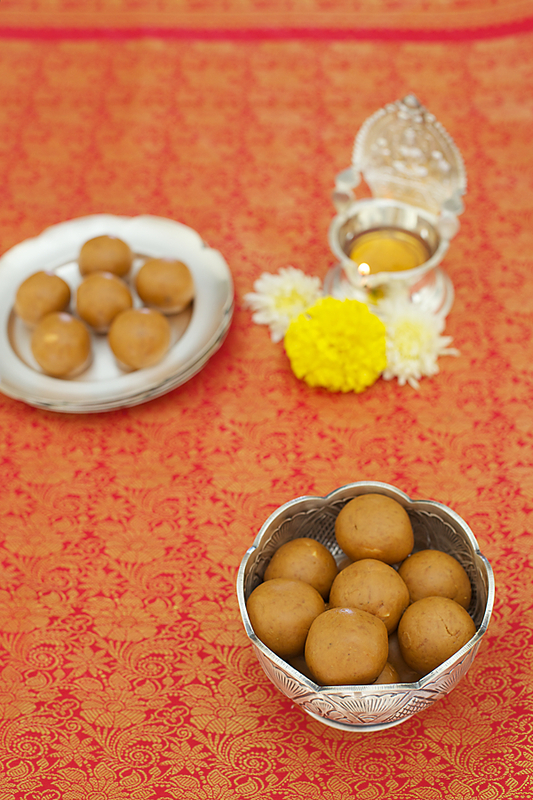 The flour to ghee ratio is pretty standard and if followed correctly, one should be able to get good laddus. That said, besan laddus are quite tricky to make and this definitely is not an easy recipe to master. Measuring right, following the recipe and trying it well should put you on the right track. But I am so delighted that it turned out so well. Really I am convinced that your recipes are very fail safe and a boon for dummies like me. Thanks. Really appreciate your generosity in sharing such excellent recipes. You mentioned that this is your grandmother's recipe. I also know from experience that you can never go wrong when you follow your grandmother's recipes 🙂 They are the best! Jayashree: Great to know that. Thanks for your appreciation. I tried this recipe with lot of anxiety that I may not get this right . 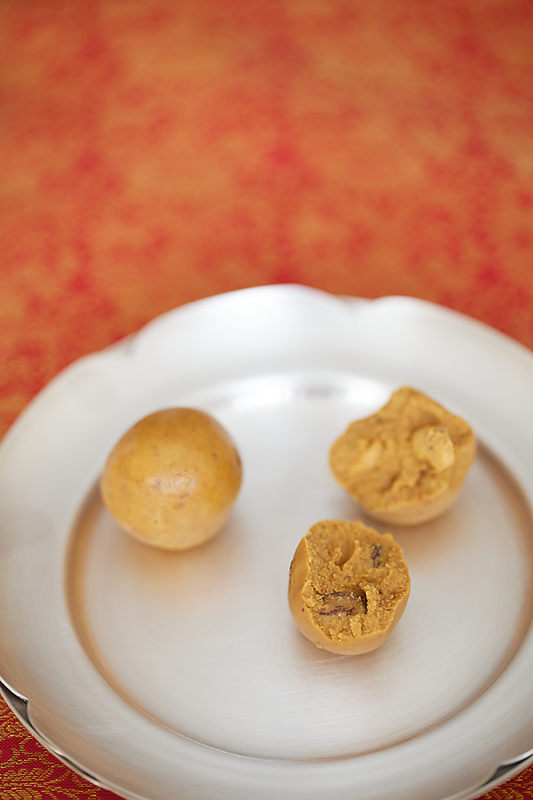 But to my surprise , it turned out to be one of the best besan ladoo that I have ever made. Thanks for this detailed and very clean recipe. lakshmi- Thanks for the feedback! Tried this recipe today.Followed the exact recipe.Came out perfect.This is the first time I am making besan laddus and I am very happy with the result.Thank you Anushruti for the perfect recipe. Savitha- Great to hear that! If the recipe is right and is followed correctly, there is no reason it should fail. Thank you so much for this recipe – It's easier than several others I've tried. I also add saffron, cinnamon and sliced dates to mine. Bethany- That's a nice twist to the recipe. Is this a magical recipe? Anushruti,like ur name ,this recipe also is so unique and lovely…thanks a ton dear. I can't describe in words but I only know how many types of besan laddoo recipes I have tried but this is simply awesome. Sneha- I'm thrilled to hear this! If possible, do share the pics on social media and tag me. Thank you. Thank you. The recipe worked like magic. Made this to offer to Devi and everyone polished off the Prasad 🙂 . I did reduce the quantity of sugar by 25%, but that's cause all of us don't like our sweets too sugary. All the tips , esp the one of adding some flour later worked like a charm. Thank you once again !